I know I often look for a good book to read from one list to another, and wonder what will be the next amazing one I’d love. Of course I wouldn’t dismiss any books listed by the Man Booker. In fact it has produced some very good books. 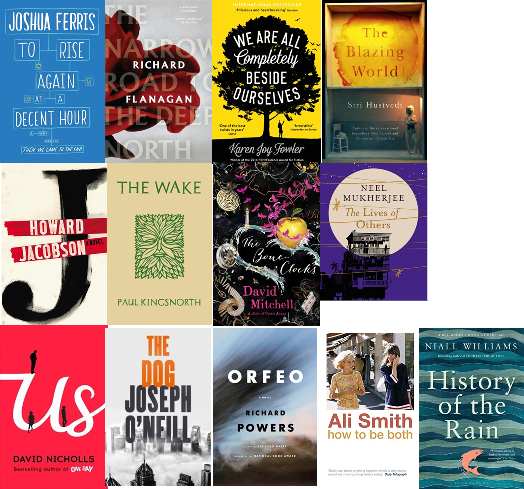 Now the longlist for this year, 2014, has been announced. Richard Flanagan, the famours Aussie writer, is one of 13, longlisted for his The narrow road to the deep north. If you’re not sure which one you’d like to read, why not try and borrow one or two from your local library, Parramatta Library? Dentist Paul O’Rourke cannot face the thought of his own mortality, and swings between religions and relationships for solace. When someone adopts his identity online, he worries that the online “Paul” may be a better version of himself. The Guardian’s Alex Clark called it “enormously impressive”. Alwyn Evans leads J Force, a group of second world war PoWs working for the Japanese on the infamous Burma Railway. The novel looks at the men on both sides, and circles through decades to explore the war’s impact. The Observer’s review declared it “a classic in the making”. Upon its release, this novel tied reviewers in knots trying to avoid spoiling Fowler’s shocking novel about a 1970s Midwestern family torn apart by a behavioural psychology experiment. The Guardian called Fowler’s 10th novel an “achingly funny, deeply serious heart-breaker”. Presented as an academic paper, The Blazing World explores the cruelty of the art world through the eyes of a bitter painter who believes her lack of success is due to entrenched misogyny. She tests this theory by persuading three men to show her work under their names, and guess what happens? Set in a brutal future where the past cannot be spoken of and the present is shadowed by a catastrophe referred to as “What Happened, If It Happened”. Two people fall in love, not knowing if they have been manipulated into the relationship. A big departure for the author of the Booker-winning Finkler Question. “With my scramasax i saws up until his throta is cut.” Eco-activist Kingsnorth crowd-funded his debut novel, a story of 11th-century English guerrillas fighting the Norman invasion written in a “shadow” version of Old English. The Guardian review declared it “a literary triumph”. Quasi-immortals battle at the margins of the everyday world; “bone clocks” are the human herd, doomed to run down and die. It’s a fantastical ride as we follow Holly Sykes, from runaway teenager to an old woman watching civilisation fail. We also meet a novelist who is cheekily reminiscent of Martin Amis. Set in Bengal, Mukherjee’s novel focuses on the affluent Ghosh family and the social divisions of the 1960s. While the young Supratik becomes a communist, the rest of his family clings to an older order. Ranging over a large cast, it was praised by AS Byatt as “very ambitous and very successful”. After the huge success of One Day, takes on marriage and parenthood. Douglas Peterson faces life alone, as his son is about to leave for college, and his wife for good. But Douglas is devising a plan to use a family holiday around Europe to win back their love. Due in September, this is bound to be the bestseller of the list. Due in September, this darkly comic novel is O’Neill’s second Booker nomination, following 2008’s Netherland. In 2007, a New York lawyer takes a job in Dubai, managing a huge family fortune. Hoping for a fresh start after a failed relationship, O’Neill’s cerebral protagonist finds his gilded new world is not what he hoped. An elderly composer reads about the DIY biology movement – people tinkering with DNA at home – and orders the kit from the internet. Els accidentally becomes a wanted man, a bioterrorist on the run. The Guardian review found the book – much more about music than terror – “formidably intelligent” and “ecstatically noisy”. The Orange and Booker prize-shortlisted author publishes her new novel, a celebration of art and versatility, on September 4. In typically playful style, it spins two stories – about a 15th-century Renaissance artist, and a “child of a child of the 1960s” – into a double narrative. Williams is best known for Four Letters of Love. This new novel features a bedbound Irish woman reading her way through her dead father’s books, as she listens to the rain on the roof. It’s a celebration of books, love and “14 acres of the worst farming land in Ireland”. This entry was posted in Australian Authors, Awards & Prize Lists, Fiction and tagged Author, Book Prizes, book review, books, Literary Awards, Man Booker Longlist 2014, Man Booker Prize, Parramatta City Library, Writer by admin. Bookmark the permalink.